On Copacabana beach, the symbol of the Brazilian art of living, beauty is exposed on every inch of beach towel. One of the beauty secrets of the Cariocas nestles in the centre of Rio, inside the famous Granado pharmacy, founded in 1870 by the Portuguese José Antonio Coxito Granado. His idea, simple but very effective, was to create remedies based on plant and herb extracts of Brazilian flowers, grown in his garden at Teresópolis. The quality of his products quickly made Granado the official pharmacy of the Brazilian Imperial family. In 1903, the immense success of his antiseptic powder gained national recognition for the brand, which then became emblematic of Brazil. More than a century later, Granado has conquered the world, faithful to its tradition of quality products with plant origins and proven effectiveness. 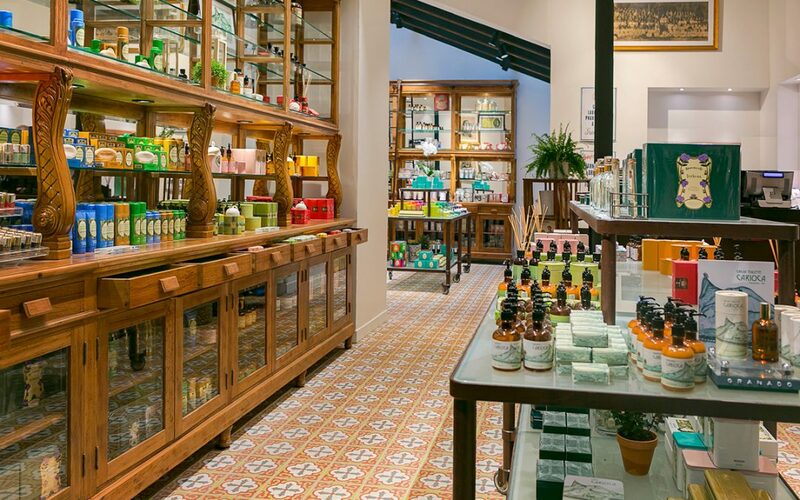 Soap bars, hand lotions, lip balms, perfumes, body lotions or shampoos; Granado offers a whole universe of traditional beauty care, to discover in the store in Saint-Germain-des-Prés, the brand’s first foray out of Brazil. Opened last winter, it takes after the decoration of the pharmacy in Rio (furniture in solid wood, concrete mosaic floor tiles) giving a total… sensory immersion! Open from 10.30 a.m. to 7 p.m. Monday to Saturday.